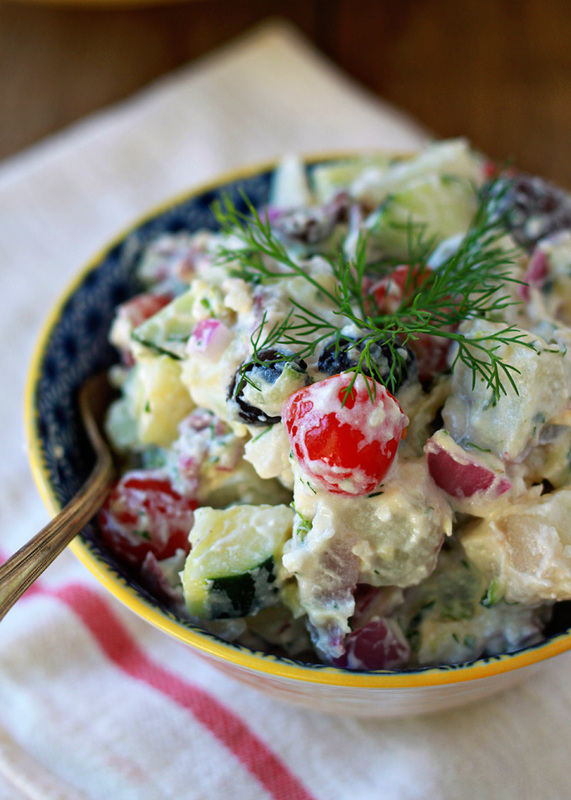 Garlicky Greek yogurt tzatziki sauce forms the creamy base of this potato salad; a healthier, more protein-packed spin on the traditional mayo. Add kalamata olives, cherry tomatoes, red onions, and cucumber for fun and refreshing summer salad. I have a dream. And that dream is, someday, to go to Greece. I picture crisp white stucco buildings packed tightly along hills, cobalt seas lapping below, sun shining, and me, in a long, gauzy, white dress with strappy sandals, strolling the cobblestone streets that weave their way between tucked-away cafes and incredible vistas. And I totally wouldn’t have blisters from the sandals and all that walking, because dreams don’t include blisters. 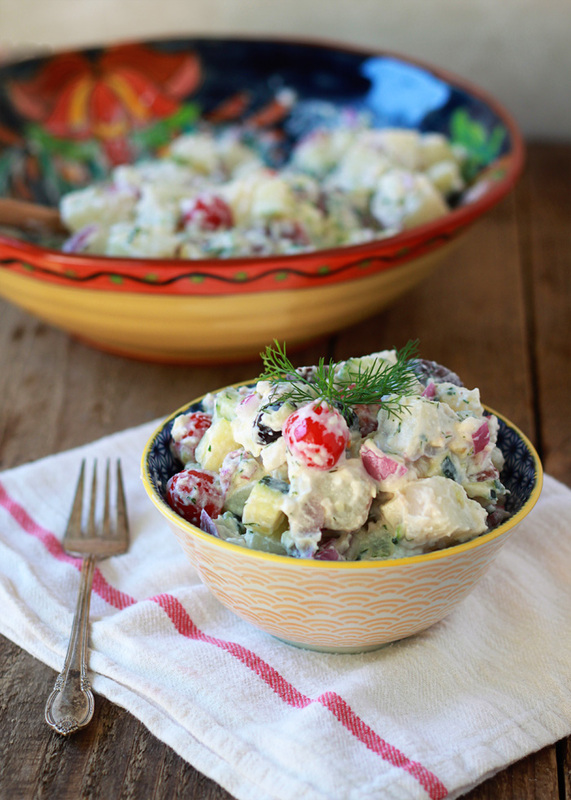 It’ll be awhile until we can get there, so for now, we have Creamy Greek Potato Salad. Which … is not even close to the same thing. But it is delicious! So there is that. 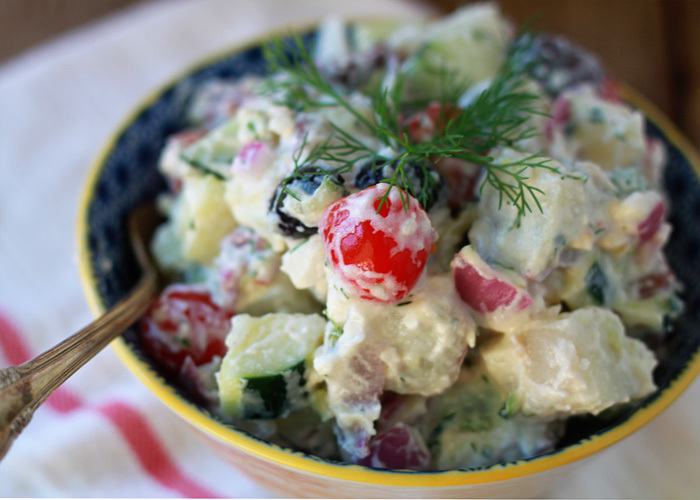 This salad brings together tender red potatoes, sliced cucumbers, cherry tomatoes, red onion, and kalamata olives, tossed in a creamy and garlicky tzatziki sauce. I love that Greek yogurt forms the base instead of the traditional mayo – you still get the creaminess of typical potato salad, but it’s a much healthier option. Healthier is good! 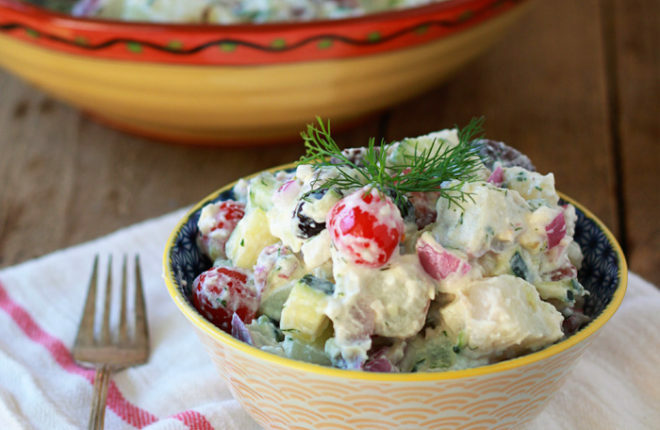 This is a light, bright potato salad bursting with Greek-inspired flavors. 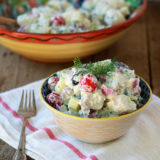 I think it’s the perfect salad to bring to Fourth of July picnics, summer potlucks, and barbecues. Just like I would be the perfect person to bring to, say, Santorini! Someday. But for now, there’s salad! Set a large pot of water over high heat. Add the potatoes. Bring to a boil. Cook until the potatoes are fork-tender, about 20 minutes. Drain and rinse with cool water; set aside to cool. While the potatoes are cooking, chop the other veggies and make the sauce. To make the sauce, add all sauce ingredients to a medium bowl and mix thoroughly. Set aside. If you’re not making the salad right away, refrigerate in an airtight container until ready to use. Assemble the salad. Once the potatoes are cool enough to chop, cut into 3/4-inch chunks and add to a large salad bowl. Add the onion, cucumber, tomatoes, and olives. Add the sauce and toss gently until all of the veggies are coated. Sprinkle feta on top, if using. Serve. May be made up to 24 hours ahead and stored in the refrigerator until ready to serve. After it sits for a bit, the salad may get a little watery at the bottom thanks to the cucumbers, but just give it a stir and you’re good to go. I much prefer yoghurt based dressings – I’m not a mayo fan, so this one’s going on my to try list. Greece is amazing, and the food is wonderful. There will be options for both of you almost evrywhere you go! (I am a vege who married a meat eater and went on honeymoon to Greece). I agree with Jo above, I am definitely a fan of yoghurt dressings over mayo ones. I have the same dream as you. One day. Me and the boyfriend and Greece. Maybe a donkey ride. Definitely some beach dwelling and some ouzo drinking. And lots and lots of marinated vegetables and veggie Greek food. Hi, Kar! Thanks for the awesome recipes! Everything, and I mean, everything I have tried on here has been SUPERB! Am making this for hubby’s car show this weekend and this may be a stupid question but do you boil the red potatoes whole and then cube then when they’re cool? Hi Jen! I’m sorry I didn’t see this question before the weekend. 🙁 Yes, you boil them whole then cube them when they’re cool. I’ll make sure the recipe reflects that (not a stupid question at all!) Hope the car show was a good one. My guy has a classic car that’s not quite finished and has car show aspirations once it’s done – I think a few of my weekends are going to be spent at car shows in the future, too!